Benchmark share indices ended lower amid profit booking in late trades weighed down by index heavyweights while gains in capital goods and auto shares helped capped further downside. Markets had gained in early trades following China's central bank’s move to cut interest rate for the sixth time in a year was welcomed by the world financial markets. 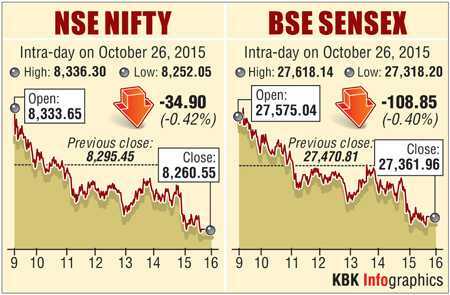 The 30-share Sensex ended down 109 points at 27,362 and the Nifty dipped 35 points to close at 8,261. In the broader markets, BSE Midcap and Smallcap indices ended down 0.5-0.7% each. Markets breadth ended weak with 1,727 losers and 983 gainers on the BSE. "Volatility is here to stay ahead of the F&O expiry this week even as profit booking is seen at higher levels. Further, stock specific movement is seen post the earnings annoucements," said Jagannadham Thunuguntla, Head of Fundamental Research, Karvy Stock Broking. Power index was the top gainer along with Capital Goods, Auto and IT indices among others while Bankex, Oil&Gas, Metal and Realty indices were the top losers. In the capital goods segment, L&T pared gains to end flat ahead of its September quarter earnings later this week while state-owned BHEL ended 3.7% higher. Auto stocks firmed up on hopes post September quarter earnings and hopes of higher demand after most them have lined up new launches ahead of the festive season. Maruti Suzuki, Bajaj Auto, Tata Motors and Hero MotoCorp ended up 0.1-2.1% each. Maruti Suzuki unwrapped its premium hatchback Baleno, with a starting price of Rs 4.99 lakh (ex-showroom, Delhi), pitting it directly against the reigning segment leader Hyundai Elite i20. UPL ended down 3.5%. Agri-chemicals major UPL today reported a 11.53% rise in its consolidated net profit at Rs 185.21 crore for the quarter ended on September 30, on account of increase in income. Bharti Airtel ended down 1.9% on profit taking. The telecom major today reported a Q2 net profit of Rs 1,523 crore, up 10.1% on an annual basis. From the metal pack, Vedanta and Hindalco surged between 0.3-2.4% each after reports suggest that the government is planning to double the import duty on aluminium. Tata Steel gained 1.4%. HDFC ended down 2.1% on profit taking. The mortgage lender today reported a 18.2% rise in Q2 standalone net profit at Rs 1,605 crore. It had reported a net profit of Rs 1,358 crore in the year-ago quarter. Total income rose to Rs 7,466 crore compared to Rs 6,635 crore in the year-ago quarter. Among other index heavyweights, RIL ended down 1.3% while ITC eased 0.5%. In the banking pack, HDFC Bank, ICICI Bank, SBI and Axis BAnk ended down 0.3-1.2% each. Among other shares, Kanoria Chemicals & Industries ended up over 6% at Rs 67 on the Bombay Stock Exchange after the company said that its subsidiary has set up a denim manufacturing unit in the African nation of Ethiopia. Gujarat State Fertilizers & Chemicals ended up 10% at Rs 76.40 on the Bombay Stock Exchange after the company reported that its net profit for the quarter ended September 30, 2015 rose nearly 15% to Rs 142.6 crore compared with Rs 124.3 crore for the corresponding quarter last fiscal. Among other shares, Kanoria Chemicals & Industries was up over 6% at Rs 67 on the Bombay Stock Exchange after the company said that its subsidiary has set up a denim manufacturing unit in the African nation of Ethiopia. Gujarat State Fertilizers & Chemicals was up 10% at Rs 76.40 on the Bombay Stock Exchange after the company reported that its net profit for the quarter ended September 30, 2015 rose nearly 15% to Rs 142.6 crore compared with Rs 124.3 crore for the corresponding quarter last fiscal.